The Mini-Circuits DAT series is specified to operate with supply voltages over the range of 2.7V to 3.3V. When operating over this range, the parts meet all their specified performance parameters over the operating environmental ranges. However, under lower than specified voltage conditions, performance is not guaranteed. Furthermore, as with any silicon driver, there is a risk of the device entering into a latch-up condition and then becoming non responsive to commands and having to be powered down and repowered under proper voltage to recover. In many systems, 3V may not be available on the PCB. 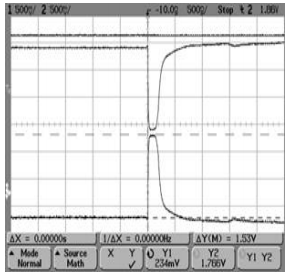 In these cases, the designer must generate the 3V from a higher level voltage supply. A clean method of generating the 3V is to use a voltage regulator IC; these devices have the capability to supply constant voltage to the DAT and other circuits, as long as the load does not exceed the maximum current capacity of the regulator chip. Another approach is to simply divide the voltage using a simple Resistive Voltage Divider (RVD) to step down a higher level voltage to the desired 3 Volts. During steady state operation the DAT units consume approximately 100 μA; however, during startup and transition from one attenuator state to another, the DAT draws higher current for a short period of time. 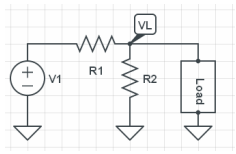 Although this "surge current" is relatively low, when using a Voltage Divider Circuit to drive Vdd, caution is required to ensure that the induced voltage drop does not risk proper operation. To assess the limits of the surge currents, hundreds of units were tested for surge currents on startup and during transition. From this testing, a smaller sample was selected to assess expected maximum surge currents. Tests to measure the surge current were performed in accordance with Figure 2. A 1kO resistor was placed in series to the RVD and Vdd pin of the DAT whereby the voltage drop across this resistor is directly proportional to the current supplying the DAT. 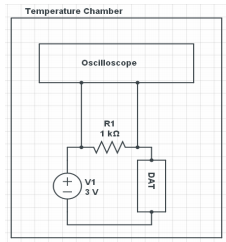 Figure 3 shows the typical oscilloscope traces on both sides of the resistor as well as the differential voltage which is proportional to the current. From this plot the magnitude and duration of the surge current it is evident. Hundreds of units were tested to establish the expected range of surge current at both 25°C and 85°C. Given the range of surge current up to 2mA, a considerable drop in voltage across a voltage divider network could occur and potentially pose a risk of latchup. To assess this, the DAT was tested with units that exhibited high surge currents. These units were tested in a typical application circuit, fed from a voltage divider as part of this validation effort and showed latchup when the selected voltage divider resistors allowed the voltage drop to bring Vdd below 2.4V. For a 5.5VDC power supply, a voltage divider of 499&ohm; and 680&ohm; will be able to provide the required surge current without latching up.